The famous 'Ceres' issue on the first January 1849 marked the necessity for postal reforms similar to these in the United Kingdom around May 1840. In specific, nationwide postal rates between Metropolitan France, Corsica and French Algeria had to be simplified. In addition, this was done to encourage the payment by the sender through the use of postage stamps. 20 centimes, one of the first two issued stamps of the series. 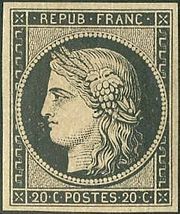 The two first postal stamps issued in France were of the Ceres series, with the her effigy (goddess of growing plants in Roman mythology). She wore a crown of branch and a bunch of grapes in her hair. The design was drawn by Jacques-Jean Barre, general engraver at the Paris Mint. In January 1849, the two first denominations were a 20 centimes black stamp and a 1 franc red. As the postal reform was extended to other rates (local, rural and newspapers), new denominations were issued. These stamps aroused philatelic interests around the world. Interestingly, the black cancellations over the 20 centimes black stamp were occasionally masked and the stamp was easily reused. The issue of the 40 centimes blue in January was aborted and switched to orange. While the 20 centimes blue was first printed in Spring 1849, it never replaced its back counterpart because of a change of rates in July 1850. In December 1849, part of the most clearer red of the 1 franc stamps were recalled by the postal administration because their colour was too close to the 40 centimes orange to be issued in February 1850. The clearer stamps were named "vermilion" by philatelists. After a coup in December 1851, president Louis-Napoléon Bonaparte, then entitled Prince-President, decided to have his effigy on French stamps. The first denominations were issued progressively from September 1852 and throughout the Second Empire. 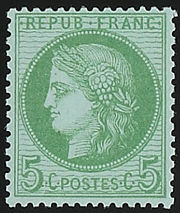 A stamp from the Bordeaux issue. During the Franco-Prussian War, after Republicans abolished the Empire of Napoléon III on 4 September 1870, they faced the siege of Paris by the German armies and the lack of postage stamps from the former rule. New Ceres stamps had to be printed until the insurrection of the Paris Commune, in Spring 1871. However, the printer claimed afterwards that he hid the Ceres series material and was forced by the insurgents to print Napoleon III stamps. 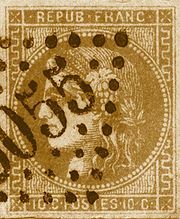 At the same time, in Bordeaux, where the provisional government fled, the printing of Ceres stamps was authorized from the 5 November 1870 to the 4 March 1871 to supply the post offices of non-occupied France. The stamps were printed in lithography (instead of typography) and stamps differ repetitively from one another. Ceres stamp issued during the Third Republic. After the war, the 'Ceres head' concept was kept until 1875. Printed only in Paris, new denominated stamps were printed by using old material (like the low values created in Bordeaux) because Désiré-Albert Barre, Jacques-Jean's son, broke his association with Hulot (custodian of the rights to print the stamps at the Paris Mint) in 1866. In July 1875, the postal administration gave the printing of its postage stamps to the Banque de France to reduce the high cost and delays it accused Hulot. The stamp design was changed too after the 'Commerce and Peace' series was introduced, following the competition (launched in August 1875) was won by Jules-Auguste Sage. The new stamps were issued in 1876. For the philatelic exhibition of Paris in 1937, PEXIP, a minisheet of four bicolored Ceres stamps was issued. The next year, in 1938, began a new Ceres series with high values (1.75 to 3 francs), alongside the Sower series and the Peace series. The head was kept into a new decorum. All these definitives retired in 1941 and replaced by Philippe Pétain's effigies, the Iris and Mercury series. In 1945, a redesign effigy of Ceres by Charles Mazelin was among the numerous definitive series to be issue in liberated France. 1999: at the occasion of Philexfrance '99 in Paris, a stamp on stamp with the 20 centimes black and a holographic Ceres head. The logo of the philatelic service of La Poste used the Ceres head. From 1849 to 1924, French Algeria used the same postage stamps and postal rates as in Metropolitan France. The Ceres series from France could be found cancelled in the French colony. In 1850 and 1851, a little number of colonies used the Second Republic Ceres stamps. From 1871 to 1877, imperforated Ceres stamps were sent to the colonies to replaced imperforated Napoléon III stamps. They served until the issue of imperforated Sage stamps in 1876. One method to recognize the colonial Ceres stamps was the cancellation with a three letter code for each colony.